cards & clutter: Hey, gullfriend! 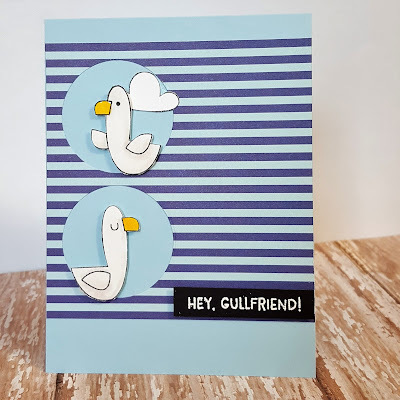 This card was based on a MFT sketch challenge. I love patterned paper but I am like a lot of people and I am not really comfortable using it. I think this particular sketch made it simple to figure out how to use some dp. I've also been wanting to use these seagulls for a little while. I stamped and colored the birds with copics. Then fussy cut them and the cloud out. 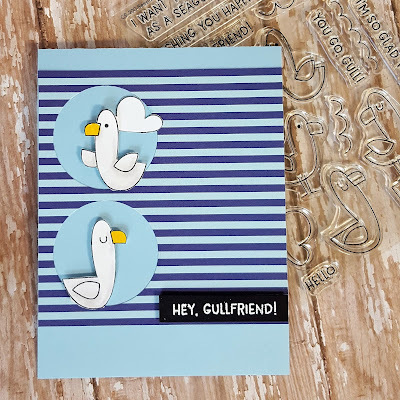 I trimmed down the patterned paper and then used a circle die to cut out the two circles for the gulls to sit in. I used foam tape behind the gulls to give it a little dimension and stuck the cloud behind the top one. 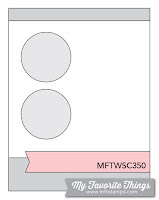 I stamped the sentiment in versamark on black cardstock and used white embossing powder. I trimmed it out and used the foam tape again. Wonderful card, great paper and a fun sentiment. Thanks for joining us at CHNS patterned Paper Challenge this month.